One of the most refreshing aspects to the start of 2008 has been the racer-driven approach of Williams. Not only did the team eschew the sport's traditional launch festivities in favour of getting on with the job of running as soon and fast as possible, but in the process the team liveried their cars with evocative messages that superbly demonstrate just what unique contributions the team have made to Formula One over the past 30 years. But, then, ploughing a lone furrow, and preferably from the front, has been a Williams characteristic right from the day Frank Williams - salesman supreme, gifted linguist, military historian, (then) fitness freak and hi-octane petrolhead deluxe - invited Patrick Head to join him in running a customer car after splitting with Walter Wolf, to whom Williams had sold his erstwhile, bankrupt team. This is a sad and sorry saga, one that saw the struggling Frank throw his lot in with the Austro-Canadian millionaire, but the upshot was he met Head, then as now a no-nonsense engineer with an uncanny ability to interpret that which is written between the lines of the sport's many rule books. Their first joint car was a March, entered in 1977 for the mediocre Belgian Patrick Neve. This temporary solution, acquired from Max Mosley's former company, served its purpose: it returned Williams to the grid as entrant, and enabled him to show prospective sponsor Saudia Airlines a real live Grand Prix car. The Saudi princes bit, and Williams (the team) were on their way, in short succession recruiting the tough-talking, hard-driving Australian Alan Jones and building their own car, the FW06. The car was good - very good by small team standards - with its nimbleness permitting Jones to shine on tight circuits. The most telling thing about the team's formation was not, however, FW06 or even that Williams (the man) was back on the grid, but rather the name chosen for the company, which is still the registered name of the primary company despite many changes of labels over the ensuing 30 years: Williams Grand Prix Engineering Ltd. Note the last word of four: Engineering. Here was a virtual technophobe who knew his only hope of getting a team together to build a car was to find external funding, yet gave the word 'engineering' equal billing with his surname and 'Grand Prix' in the name of the company he formed. Then as now the racing car was more important than razzmatazz, and it is this philosophy that epitomises Williams to this day. Williams are unique in being neither fish nor fowl: not manufacturer-owned or -aligned; nor struggling, back-of-the-grid privateer. Their engines come from Toyota, yes, but Williams are (now) very much a customer working in isolation except in matters engine. The best indication of the relationship between Williams and Toyota is the almost total lack of Toyota identity on the new (and 2007) car: this more than any other implies that the engine supply arrangement is purely commercial: Williams pay for an agreed sum for an agreed supply of engines and that is it. Yes, Kazuki Nakajima - ironically the son of Japanese driver Satoru, whom Williams allegedly refused to engage in the 80s despite then-engine partner Honda's best urging - bears allegiance to Toyota on helmet and overalls, but he is a Toyota Development Programme driver and sported Toyota logos before hitting F1. But, the helmet of Nico Rosberg - ironically the son of Keke, whom Williams employed at the last minute in 1982 after Alan Jones abruptly retired, but rewarded the team with the 1982 world title - is a Toyota-free zone, with his race suit bearing just one Toyota logo. The car, too, is almost free of Toyota livery, with virtually insignificant Toyota badging to be found only on the lower reaches of the engine cover - as it was last year, when the team's otherwise comprehensive media pack made but a single reference to 'Toyota'. These two drivers, though, are rather uniquely (that word again), the sons of Grand Prix drivers, and both, it can be said, display their father's genes in abundance. 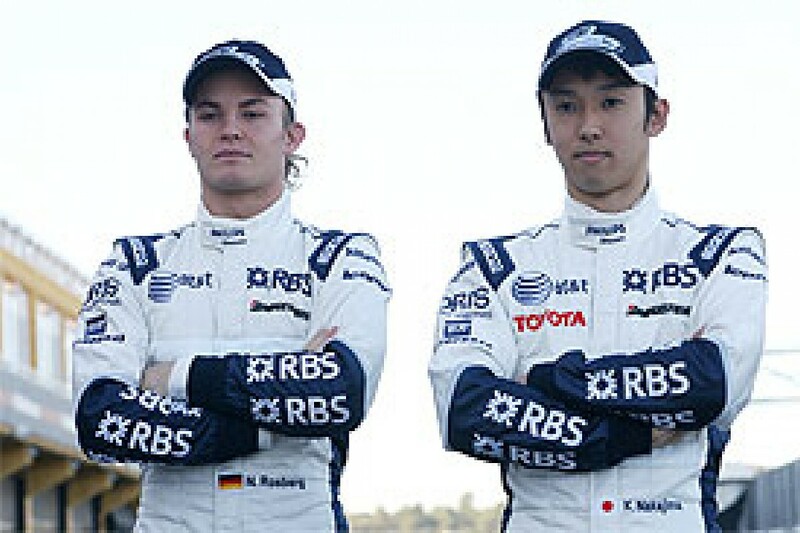 Nico is a charger in the Keke mould, and great things are expected from this highly intelligent, quad-lingual German citizen (his mother is from that country), while Kazuki has the sport's niceties still to learn, but is exceedingly brave. Racers both. So, with Williams not being a manufacturer team and employing two young chargers, it must be struggling financially, right? Wrong, as quick glance at their stationery proves: the team have arguably the world's largest telecoms company (AT&T) as title sponsor (with, though, little on-car signage), and support from RBS (which can't be too shabby a bank, for it recently loaned F1's owners CVC Partners upwards of $2bn), Lenovo (the former HP), Dutch electronics giant Philips, Reuters, and Air Asia. Add in Accenture (management and accounting), Allianz, Petrobras, DeWalt power tools and a host of smaller backers, and it is clear the team is far from battling. Critics point out that Williams posted a loss last year, but so insignificant was it (25m GBP) when expressed as a fraction of turnover that it really is no big deal - and proves that Williams do, after all, spend every penny going racing. The team operate two wind tunnels - the latest paid for out of the proceeds of the sale of Sir Frank's private jet, which, given his personal circumstances, was more vital a tool than the yacht the long-gone Eddie Jordan refused to sell - and has never been known to skimp on performance-related kit. While manufacturer teams and backmarkers alike harp on about the cost of Formula One as they seek weird and wonderful concepts to reduce the costs of doing business, Williams quietly get on with the job of investing that on sponsor acquisitions. The word in the paddock is that yet another blue-chip name will be added when the team announce their definitive 2008 livery in exactly a fortnight. And, what of rumours that Williams have sold out to the controversial Icelandic billionaire Jon Asgeir Johannesson and his Baugur Group? The team have so far steadfastly denied the rumours, and whether or not Iceland becomes the next country after India to join F1 remains to be seen. But, why should Williams sell? Doomsayers suggest the man should sell to the highest bidder, but given that he is but 66 and his partner of the last thirty years is three years younger, there exists no earthly reason why they should quit. Grand Prix racing is, after all, Sir Frank's passion, and by removing that he would effectively be removing his reason for being. All who has seen the glint in his eyes when Nico takes another car in the heat of battle knows that Williams is far from ready to relinquish the reins of an entity he controls via a team of highly qualified businessmen - Head as Director of Engineering, CEO Adam Parr, COO Alex Burns, Head of Marketing Scott Garrett, and the redoubtable Sam Michael as Technical Director. This week the team unveiled the fifth in a series of anniversarial liveries celebrating their 30th season as fully fledged Grand Prix team. Only two teams are older: Ferrari and McLaren, with the former's shares toing and froing between the Ferrari family, the Fiat Group and various subsidiaries, and a bunch of banks; while the latter's has changed hands thrice since being incorporated in the early 60s, and been heavily diluted. By contrast, Williams's shareholding appears to have remained constant according to records, and it is thus the oldest team surviving in the original form and under the company's founders. These special liveries have all celebrated Williams milestones - races started, laps raced, points scored, etc - with the more laudable achievements, such as the team's upcoming 500th Grand Prix start in Turkey, receiving conspicuous treatment. The latest, though, is extra-special as it carries messages from all seven world champions to have won titles with the team - only Ferrari beats this team in the world champion variety stakes - and lists the 15 of 31 drivers to have won Grands Prix with Williams. Williams are the last of an almost extinct breed: a team owned by men whose every fibre is aimed not at selling cars or soft drinks or clothes or cigarettes but at winning Grands Prix for the sheer love of it. That each passing season, each rule and regulation change, each sop to customer cars or dubious technologies, reduces the chances of the team's ilk joining for the same reason as Williams makes the sport of Formula One Grand Prix racing immeasurably poorer. Ultimately Williams have proven to be the ultimate survivor - and if their penultimate colours include such an illustrious roll call - Jones, Rosberg, Nelson Piquet, Nigel Mansell, Alain Prost, Damon Hill and Jacques Villeneuve, plus the likes of Mario Andretti, Davis Coulthard and, somewhat tragically, Ayrton Senna - imagine how evocative will be the final livery.